After a nice walk or bike ride around Umstead State Park, a good meal and smooth craft beer are the perfect refreshments. 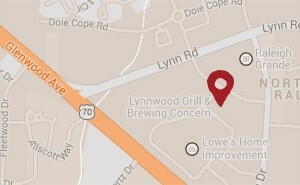 Located just minutes down Highway 70, Lynnwood Grill & Brewing Concern is just the place you’re looking for to enjoy a nice afternoon or evening. Our bar and grill’s environment is fun, comfortable and welcoming, and you’ll find that LBC is an easy spot to spend time. While watching the game or hanging out on our rooftop patio, snack on our appetizers, share (or don’t share) one of our specialty pizzas, or fill up on one of our baked classics. Don’t leave our restaurant near Umstead State Park without trying our house-brewed craft beer. We’re sure to have your favorite brew with our selection of IPAs, ales, belgians, ambers and more. Try our national award-winning Kiss My Irish Stout dry stout or Once You Go black IPA to taste the Lynwood Brewing Concern difference. At Lynnwood Grill & Brewing Concern, we love getting to know our customers when they sit and stay awhile — but if you’re on the go, we have options for you too. Order your food online and pick it up on your way to Umstead State Park for a picnic, or stop by for a cold beer after a long hike. We know Umstead State Park is a lot of fun, but if you’re looking for weekly specials, trivia night and a calendar full of exciting events, Lynnwood Grill & Brewing Concern is the place to be. 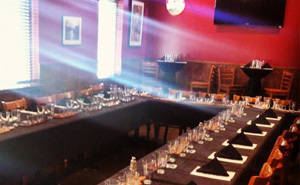 Contact us at (919) 785-0043 for questions about our menu, craft beer or other services. Lynnwood Grill & Brewing Concern is located just down the road from Umstead State Park, so stop by and enjoy our microbrews, specialty pizza and more.